Orange amplification products have been a popular choice for musicians with their unique look and sound. Now AMS and Orange are drawing attention from fans by presenting the Orange Micro Terror Giveaway that sends a Micro Terror Guitar Amplifier Head and Micro Terror Speaker Cabinet to one contest winner. Beginning Wednesday, November 14th, Musicians are invited to sign up for the Orange Micro Terror Giveaway on AMS’s Facebook page. Pictured above are the Micro Terror Guitar Amplifier Head and the Micro Terror Speaker Cabinet. The Orange™ product line has been desired for many reasons. Some want its vintage look, while others may appreciate its dependable performance. Regardless of the reason, the Orange Micro Terror Giveaway results in every musician having an opportunity to win popular Orange Terror gear. This is a limited-time contest which begins November 14th and ends on November 21st. Anyone wishing to enter the contest may visit the American Musical Supply Facebook page where they will find information to guide them to the entry form where they can submit their contact information. Completion of the form ensures AMS will have the necessary information to alert the winner. 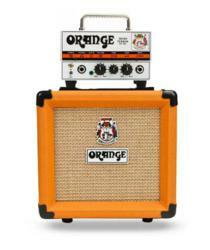 The Orange Micro Terror Amp Head is built with the toughness of Orange Amps. The steel casing protects against the hardship of the road, and yet is highly portable in its unique compact form. Along with these distinct physical features, the Micro Terror is a 20 watt amp that produces notoriously forceful distorted and overdriven tones, and is capable of powering a 412 cab with ease. This amp head gives the guitarist total control with volume, tone, and gain controls which provide a wealth of dynamics and warmth. Also involved in the Orange Micro Terror Giveaway is a 1x8 Orange Speaker Cabinet that can be stacked with the Micro Terror Guitar Amp to create a tiny amplification stack that’s full of big sound. This cabinet is comparable to a smaller version of the Orange Tiny Terror, a guitarist favorite. Musicians may be surprised at the amount of sound this 8-inch cabinet can produce. The cabinet yields 20 watts of power, and 8 ohms of impedance (important to know for avoiding overloads). Orange is known for bringing British vintage style to musicians. Many artists swear by the look and sound of Orange Speakers, such as: Jimmy Page, Jim Root, and Geddy Lee of Rush among others. Now is the chance for another musician to be part of the Orange family with these legends. The last day to sign up is November 21st so those wishing to enter are encouraged to do so quickly. For more information or to enter the Orange Micro Terror Giveaway please visit the AMS Facebook page. Located in Oakland, New Jersey, American Musical Supply is a leading online merchant of professional and affordable musician equipment and supplies including guitars, amplifiers, live sound, DJ gear and more. AMS offers award-winning customer service and the American Musical Supply website has also been ranked in Internet Retailer’s top 500 e-retailing businesses.